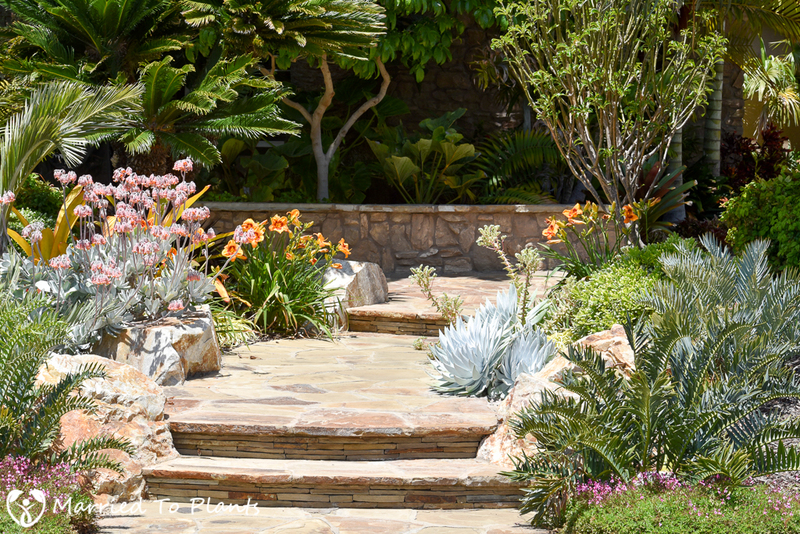 Gardeners know how easy it is to add color to their landscape. The choices nowadays are truly endless and the list expands daily. What a great time to be a gardener. Red, orange, yellow, green, white, brown, purple, pink. All easy. Getting black and blue in the garden, however, can be a different story. So why is blue in the garden difficult? First off, true blue doesn’t exist naturally in the plant world. If you see it, it is usually the result of using dyes on white flowers. Mostly what we see are really just shades of purple. Oddly enough, almost all pollinators, like birds and insects, detect blue as a wavelength, so you would have figured after millions of years of evolution we might get a few baby blue flowers. The second reason you don’t see blue is that there is no direct way for plants to make that color, as no true blue pigments exist in plants. Simply put, the blues we do find in the garden are the results of plant minerals and other pigments working together to give you the false blues you do see. Because blues are usually an irregularity in most gardens I visit, I make an extra effort to add as much as I can to my own garden. When done right, blues really stand out in the sea of green. 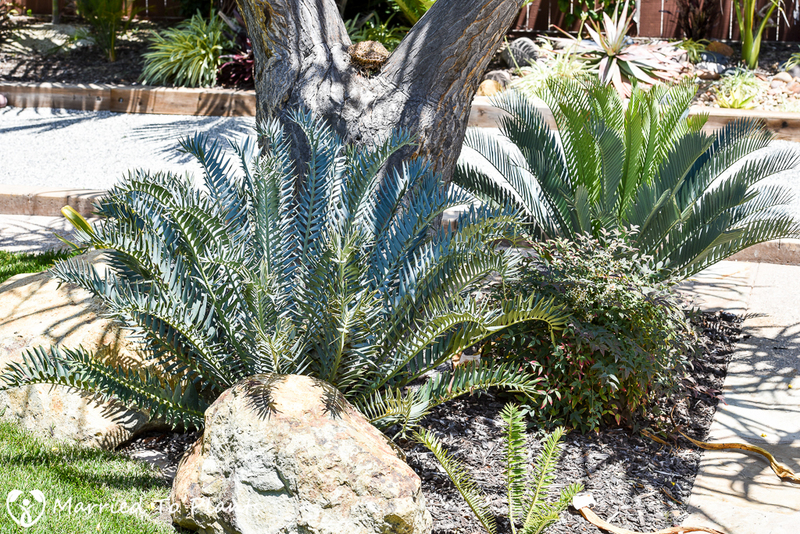 My favorite blues to add come from the cycad world thanks to the genus Encephalartos. Below we have Encephalartos princeps and Encephalartos horridus in the second and third pictures. 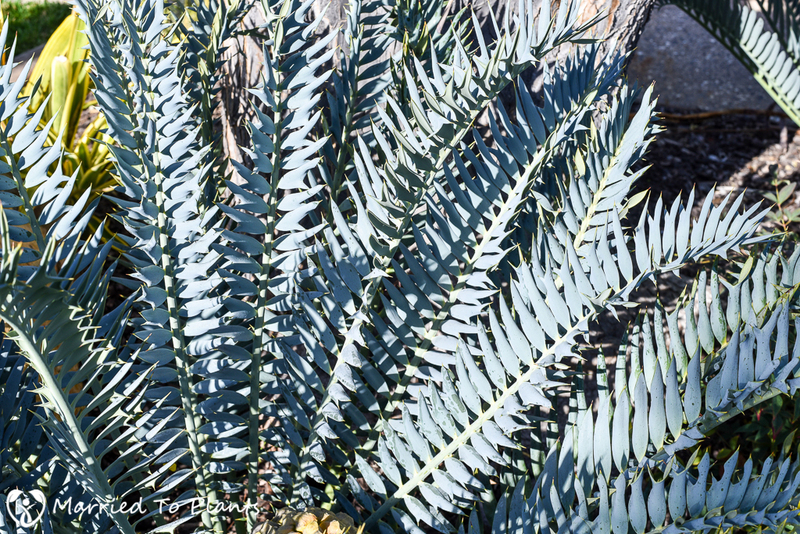 The blues in the genus Encephalartos tend to be an icy blue color. Unfortunately for readers of this post, the colors show much better in person than in pictures. 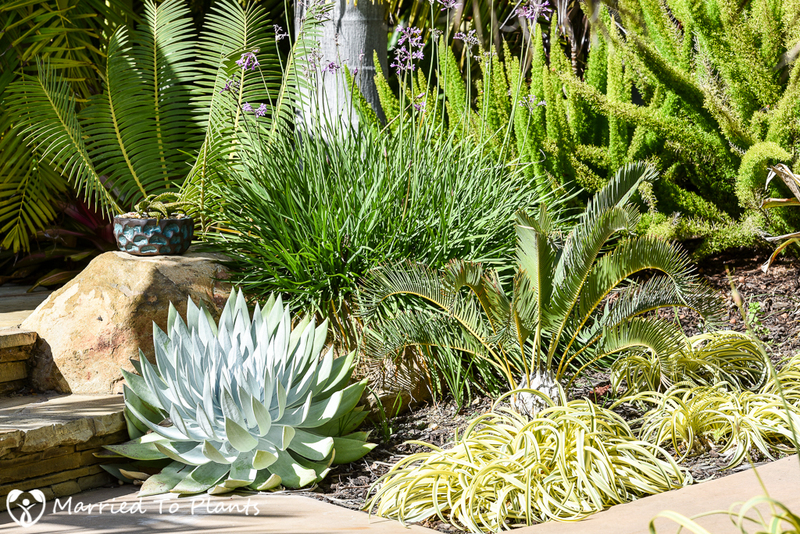 One of my bluest cycads is some unknown Encephalartos hybrid shown on the bottom right in the photograph below. 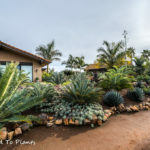 Palm trees are another great way to get blue in the garden. 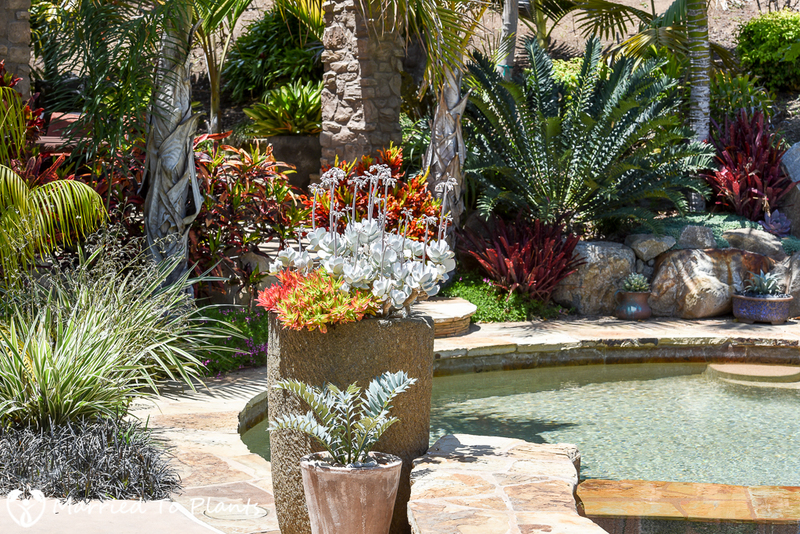 Most tend to take up a large chunk of real estate in the garden but some are well worth making space for. 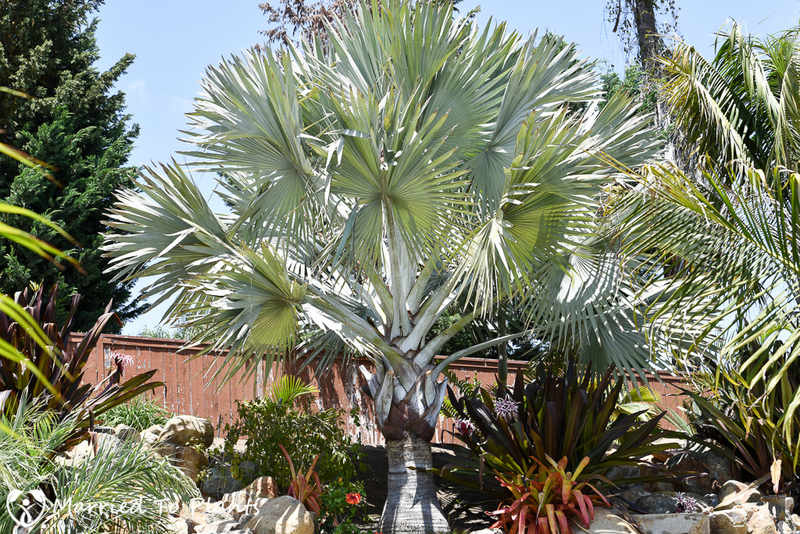 Easily the current champion of blue for Southern California is Bismarckia nobilis. Just as stately as it is blue, it is hard not to notice one of these in any garden. Hard to tell from the picture below, but another great blue-colored palm tree is Dypsis decaryi. 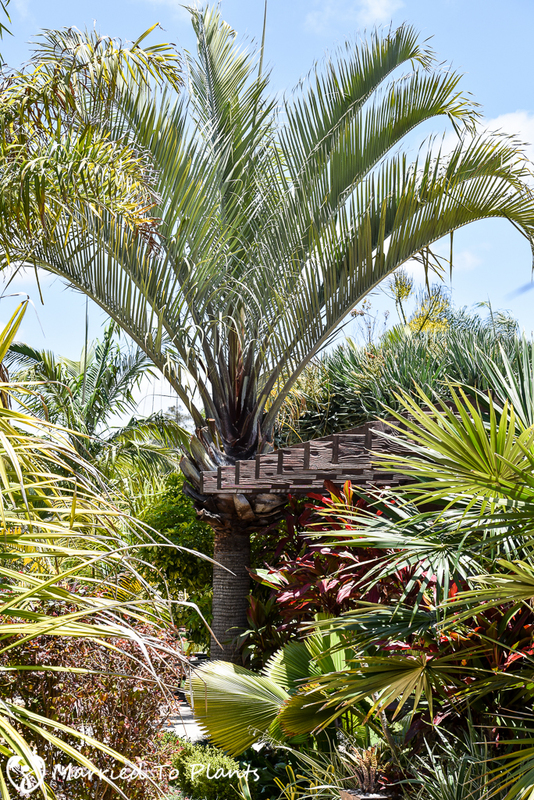 I have always said that if this Madagascar native were rare that it would be one of the most sought after palm trees in the world. 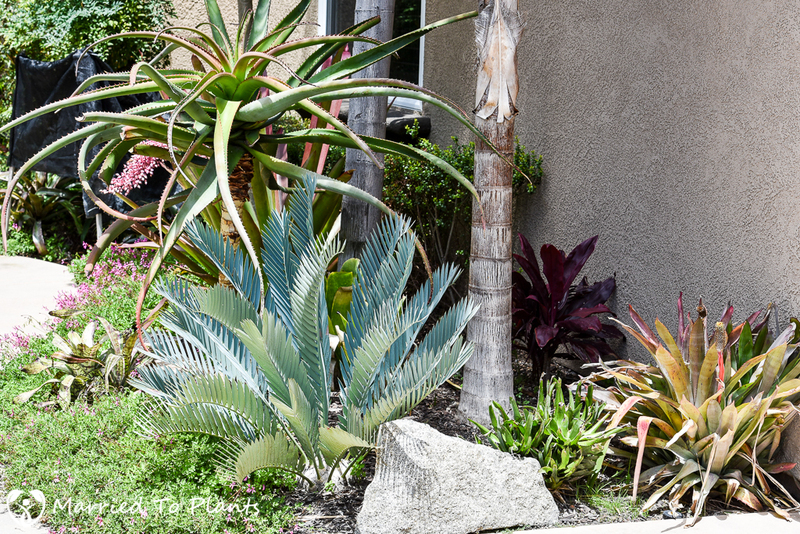 Blue leaves, tristichous grow and the red fuzz at the leaf bases make this a gorgeous palm. 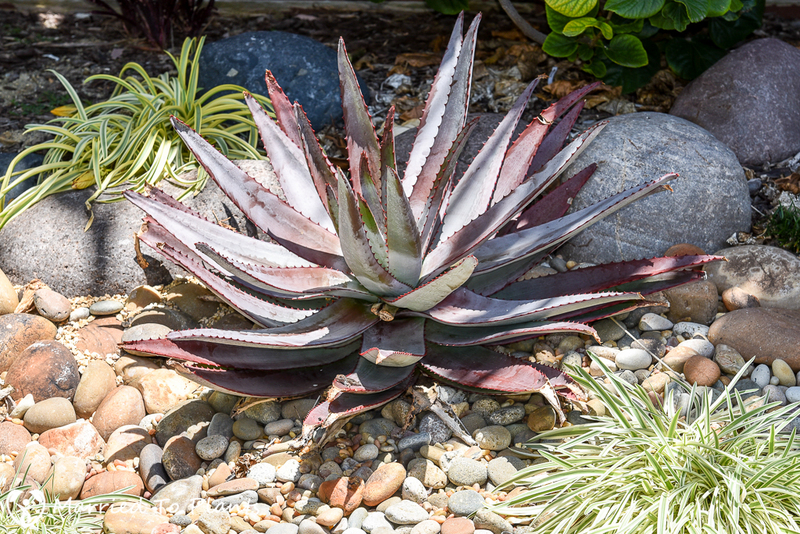 Another popular landscape plant, especially for water-wise gardens, is Echeveria lilacina. More white than blue, it still pops. 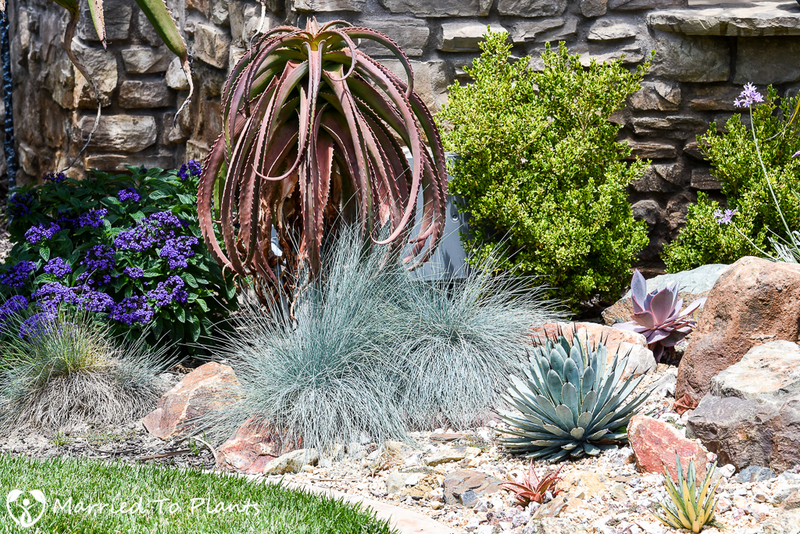 Below, Aloe betsileensis is showing off its winter coloration. With the coming summer heat the more purple hues will change to blue. 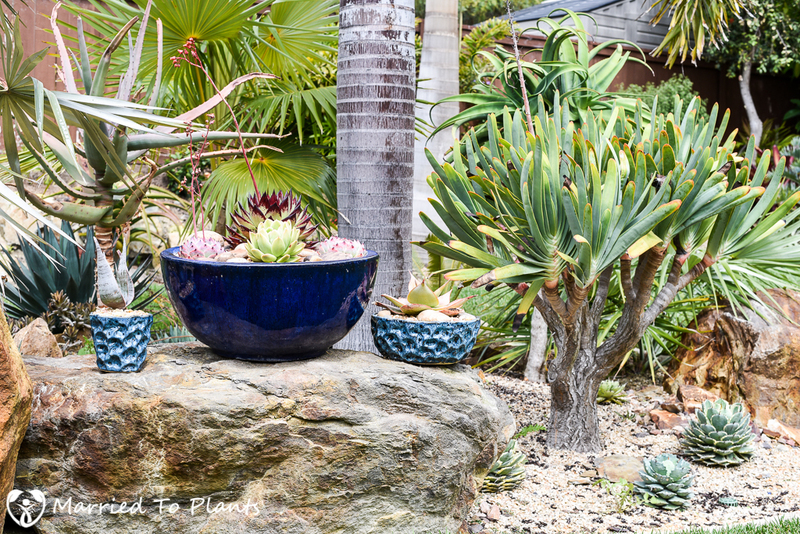 Aloe betsileensis is the ‘bluest’ aloe from Madagascar I grow. 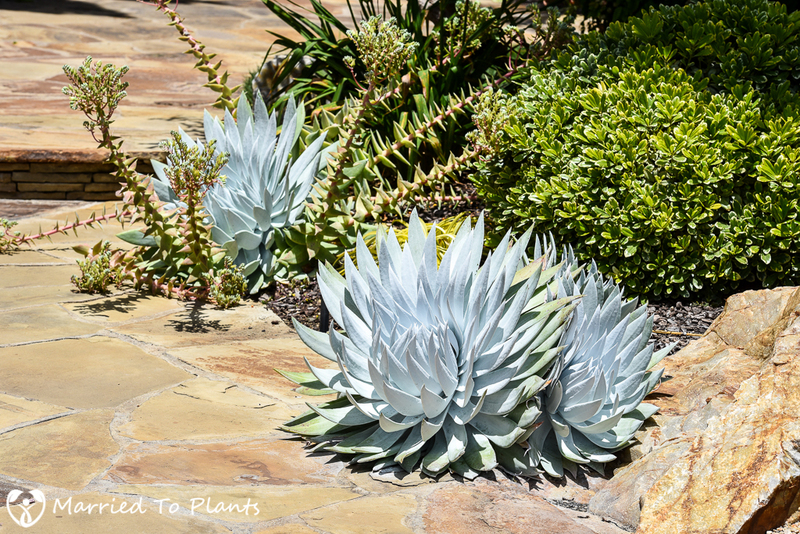 Currently my favorite blue succulent I have in my landscape is Dudleya brittonii. Yes, I know I am pushing the whole blue thing with this plant, as when well grown it is almost snow white. But I like this one so much that I am doing a blog post on it in the coming weeks and I still see lots of blue in it. 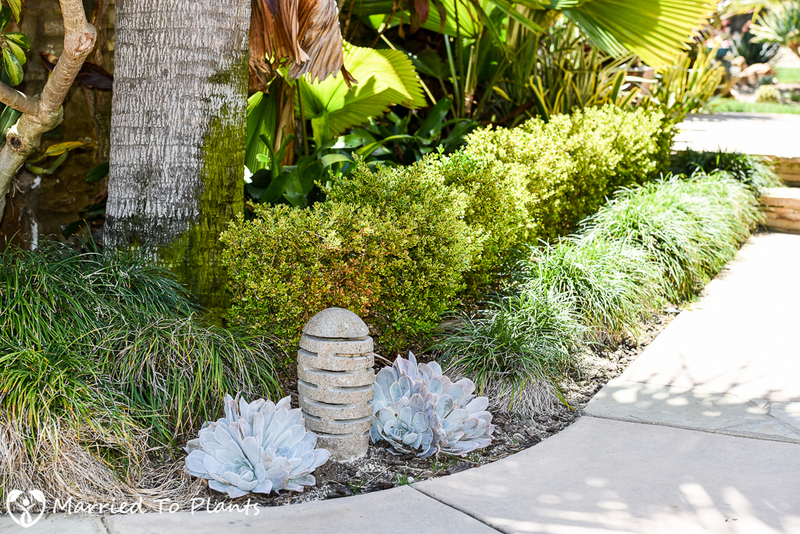 While Dudleya brittonii is gaining popularity with water-wise gardeners, it is still not a common sight. Which is a shame, as it does well in so many garden settings. True blue, as I mentioned earlier, does not exist in nature. So the only way to introduce it into the garden is artificially. 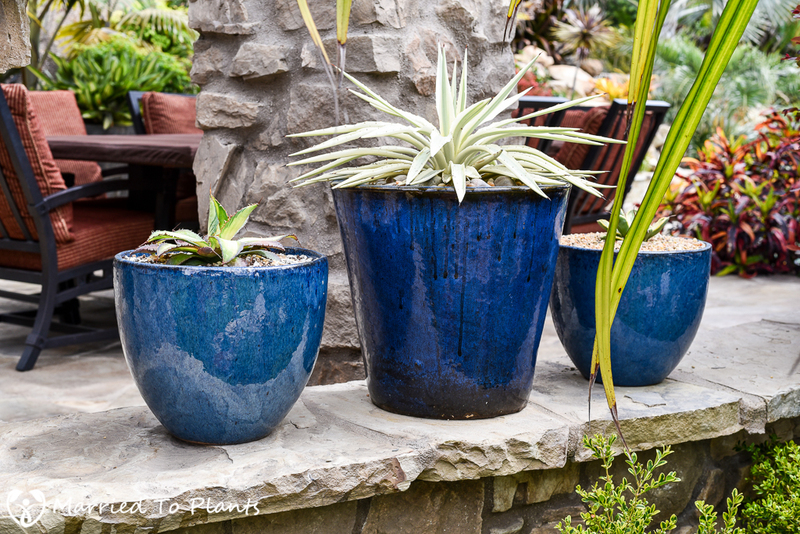 One of the easiest ways is through the use of blue ceramic pots – which I am a huge fan of! Nature shows us every day that plants and the flowers on them are supposed to be bright and colorful. It is how things evolved in a world where pollination is king. 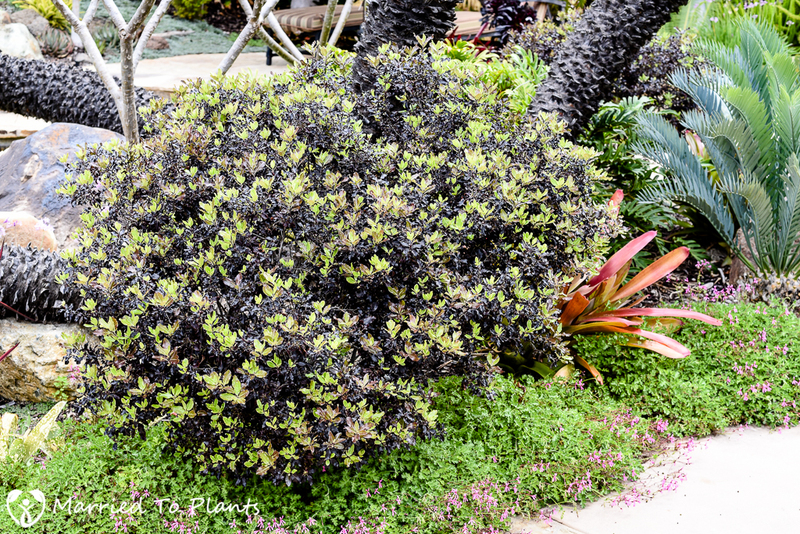 Black flowers can’t attract pollinators, so no plant will evolve to form black flowers. Of course, there are some exceptions. This includes Lisianthius nigrescent (Flor de Puerto), which has been stated to have the blackest flower in the world and only flower known to completely absorb all wavebands of both ultraviolet and visible light. The first manmade black flower is the famous Black Tulip. Nowadays we have a black petunia, black rose, black pansy and evan a black dahlia. But as with true blue, there is no such thing as solid black in nature. All the black flowers listed above are really just a very dark purple. 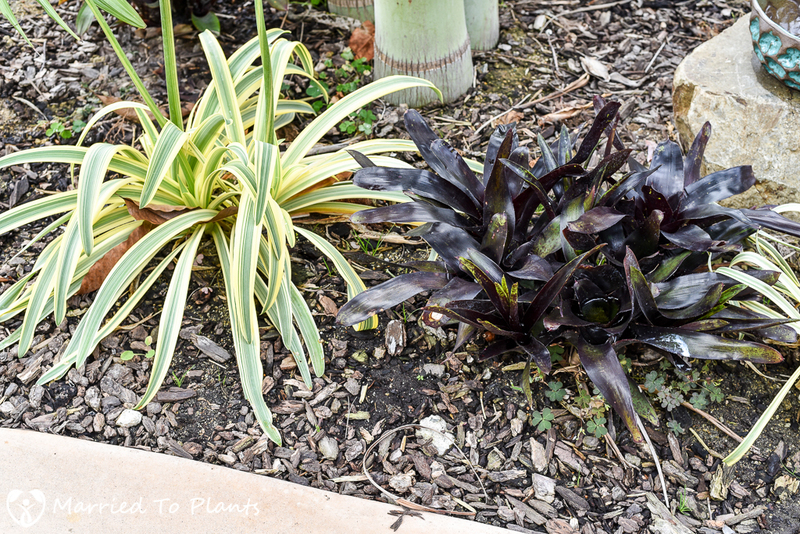 So why would anyone want a morbid color like black in their garden anyway? Because it is cool, of course. 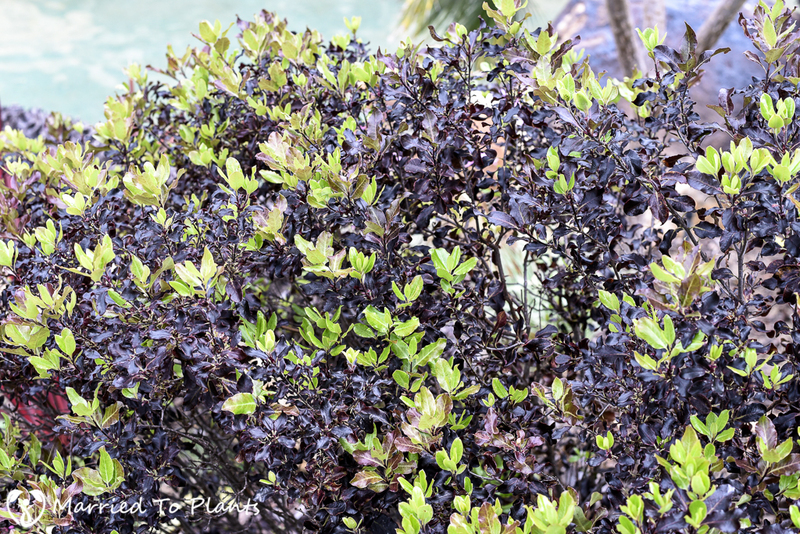 Just look at this Pittosporum tenuifolium ‘Tom Thumb.’ Right now mine is flushing new leaves that start out green. But once hardened off, they are all black. It is also a plant I get asked about often when people tour the garden. 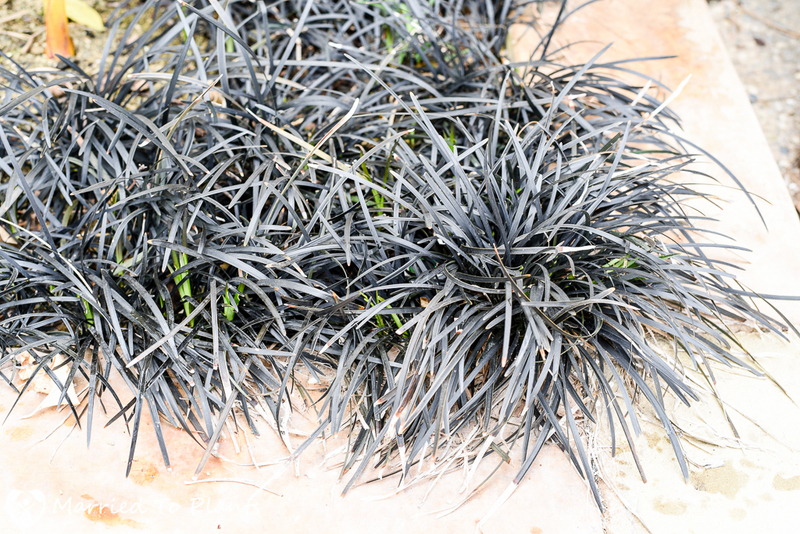 Black Mondo Grass is the Blue Fescue of the dark world. Unfortunately it is an expensive plant so I can’t use it as much as I would like. But over the last ten years I have been able to divide a bunch of clumps and spread it around the garden as a low-growing border plant. 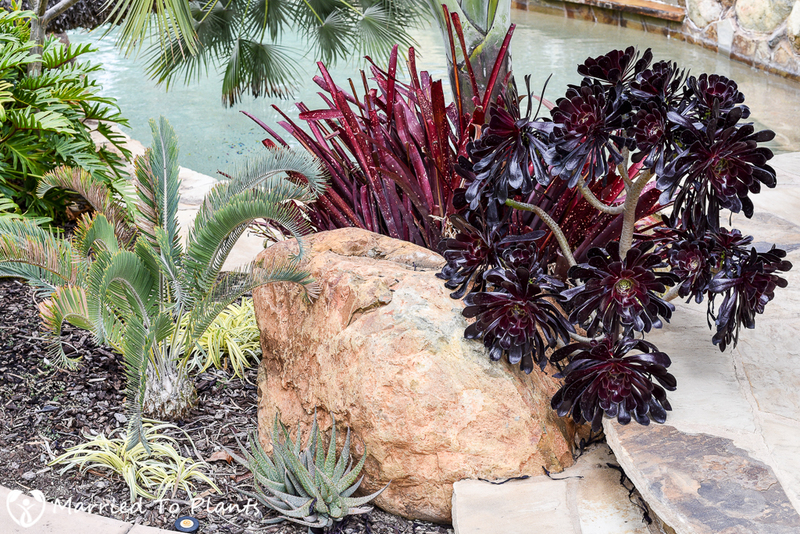 This unknown black Neoregelia looks great surrounded by variegated Agapanthus. 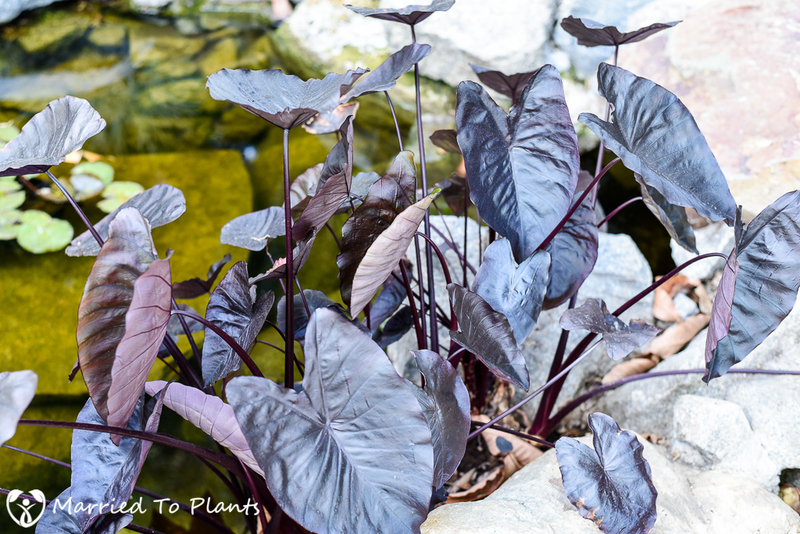 Colocasia esculenta ‘Black Magic’ is another great plant that brings dark color to the garden. Even better is that it grows just as well in the ground as it will in water like shown below. 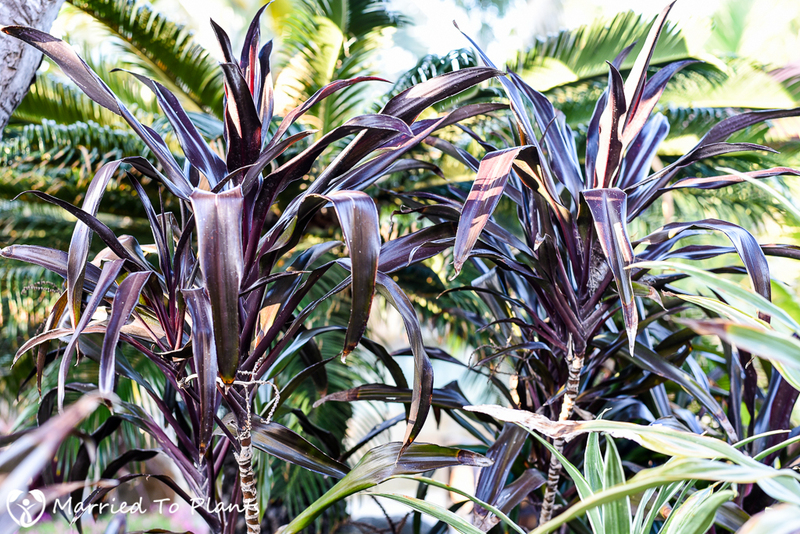 Cordyline terminalis ‘Black Ribbon’ can get really black when grown in sun. I have a few other blacks and blues scattered around the landscape. I am always looking to add more. I just added a nice black-leafed Anthurium that I am excited about. Any other fans of black and/or blue plants out there? How are you getting black and blue in the garden? 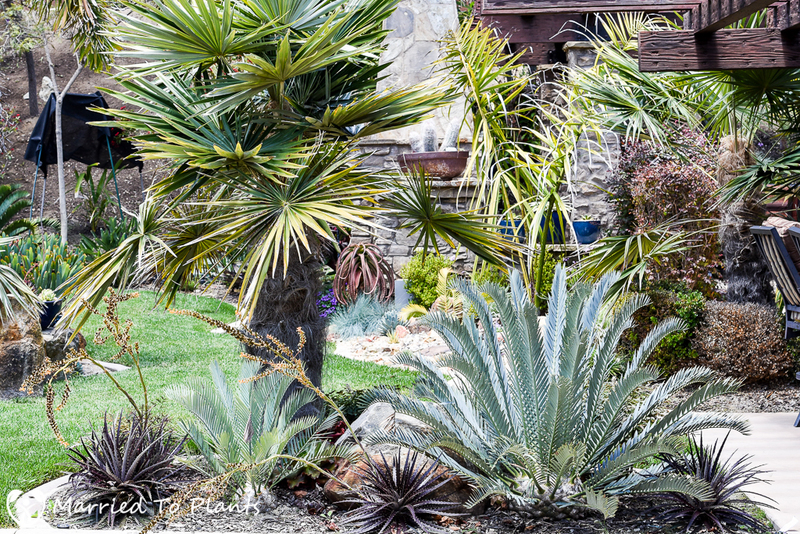 Love this subject and would add melianthus, some of the blue grasses like Leymus ‘Canyon Prince,’ of course yuccas. 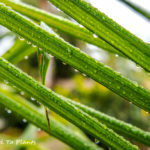 I’m getting lots of seedlings from my triangle palm the past couple years and wonder if you’re seeing any from yours. Thanks Denise for the additional great options. Leymus ‘Canyon Prince’ is one I have never tried and have some spot for right now.As far as the Triangle seedlings, no. However I use to get tons of seed. So much in fact that I now cut off the flowers as they come out. 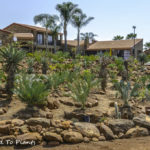 This also helps me control the nutritional deficiencies these palms are known for once they flower.